Chase Pearson (center) of the University of Maine looks take the puck away from of the University of Massachusetts during a game at Alfond Arena this season. Pearson, who on Monday signed with the NHL's Detroit Red Wings, was named Hockey East's top defensive forward for 2018-2019. 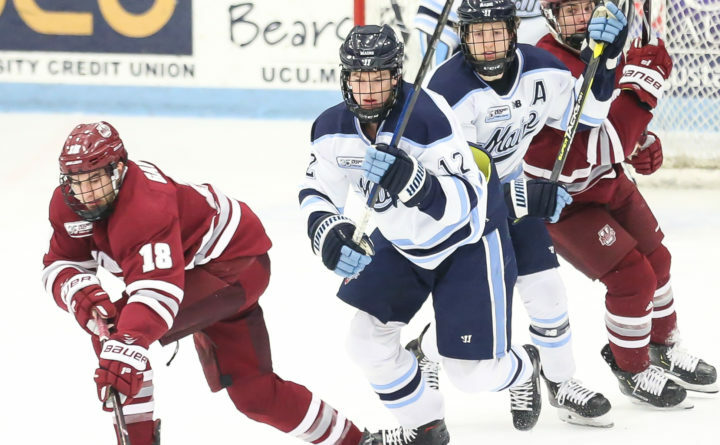 Junior forward Chase Pearson, who on Monday signed a contract with the National Hockey League’s Detroit Red Wings, heads a list of four University of Maine players to receive postseason awards from Hockey East. Pearson, a center from Alpharetta, Georgia, was named the Gladiator Custom Mouthguards Best Defensive Forward and also was chosen for the all-conference second team as voted by the league’s 11 head coaches. Black Bears junior Mitch Fossier and sophomores Brady Keeper and Jeremy Swayman were all named third-team all-stars. Keeper also has gone pro, signing with the NHL’s Florida Panthers. Pearson totaled 78 points (37 goals, 41 assists), a plus-18 rating and 132 penalty minutes in 107 games over three seasons. This season, he registered 16 goals and 13 assists and had a plus-21 rating. Fossier, a left wing from Alpharetta, Georgia, posted eight goals and 28 assists, the latter of which ranked third in Hockey East and 11th in Division I.
Goaltender Swayman earned four HE Defensive Player of the Week awards while making 35 starts. The Anchorage, Alaska, native registered a .919 save percentage, a 2.77 GAA, and 14 victories. Keeper appeared in 36 games and led UMaine defensemen in goals (7), assists (15) and points (22). The 6-foot-0, 202-pound native of Cross Lake, Manitoba, played two seasons in Orono, posting 13 goals and 31 assists in 73 games. Cale Makar of the University of Massachusetts was named the Hockey East Player of the Year, Northeastern’s Cayden Primeau won the Stop It Goaltending Goaltender of the Year honor and Mitchell Chaffee of UMass was the scoring champion. Joel Farabee of Boston University is the Pro Ambitions Rookie of the Year and Greg Carvel of UMass was selected as the Bob Kullen Coach of the Year. Primeau also earned the Hockey East Three Stars Award.